With Vision360 Enterprise, Manual AP Invoice Data Entry is a Thing of the Past. ​Nothing to buy. No expensive OCR software. No more headaches. As companies seek opportunities to contain labor costs and streamline operations, Accounts Payable departments face conflicting pressures to enhance their level of service while at the same time reducing staff costs. New technologies have long held the promise of achieving improved operational efficiencies while saving money. To address the costly burden of manual entry, filing, and retrieval, Accounts Payable departments have embraced standardized ERP systems, electronic invoicing, document imaging, workflow, and archiving. 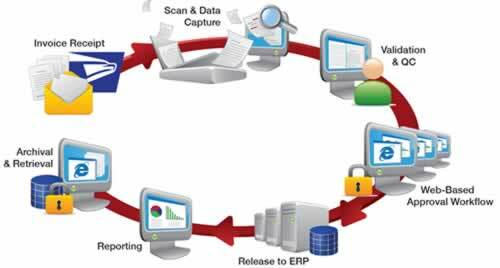 But perhaps nothing to date has presented AP departments the transformational opportunity afforded by Vision360 Data Capture, a solution that virtually eliminates data entry. 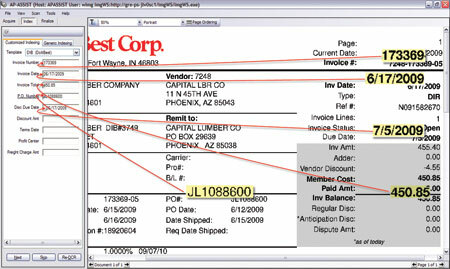 Vision360 accounts payable invoice scanning and data capture will capture all of the required data from your supplier invoices, verify the data for accuracy, match the data against external sources like your vendor master and purchase order files ensuring completeness and the highest level of accuracy possible. Vision360 captures invoice details from hundreds of thousands of supplier invoice each day. 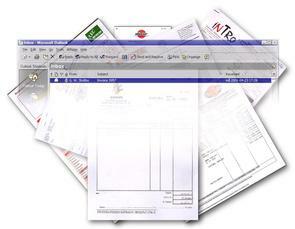 There is no need for templates or to purchase costly OCR software. Convert supplier invoices into data that can be matched, routed and integrated with any ERP system. Eliminate Manual Data Entry of Your Accounts Payable Invoices. Get your accounts payable scanning and AP automation project up and running in a few days, to a couple of weeks and in less than thirty days without the headache and frustrations of complicated OCR software. Vision360 Capture will process your supplier invoices, extract and validate the invoice details and deliver the data back to you within 24 hours of receipt. This will be a blend of scanning accounts payable invoices that are received in paper form and automatically capturing invoices electronically that are submitted via email or fax. Vision360 Capture can handle an unlimited volume of invoices and is flexible enough to accommodate the highs and lows associated with processing vendor invoices. Our business model provides our customers with unlimited growth and flexibility without the added costs. We offer our customers exceptional value as they benefit from our ability to provide a transactional cost model, as opposed to the high up-front cost to purchase expensive OCR software, licensing and professional services fees - before you even get started. In addition to scale, we incorporate state of the art workflow, highly skilled staff and and advanced technologies which allow us to capture invoice data at costs from 30-60% lower than an in-house or OCR model.